We analyze carrying capacity and limits of acceptable change to find out. 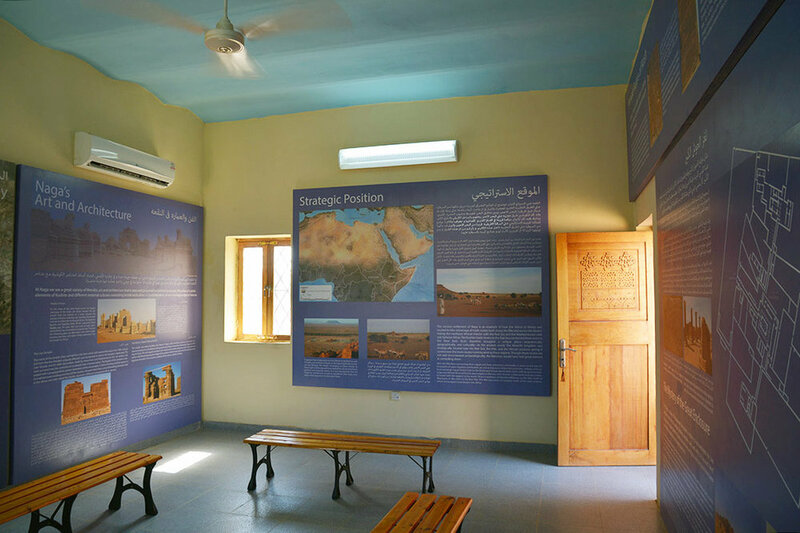 In January 2014, following the convocation of the Workshop Towards Sustainable Tourism at Meroe, which took place in Khartoum, Sudan, a number of management objectives were developed, aimed at protecting the Outstanding Universal Value (OUV) of the UNESCO World Heritage Site of the Archaeological Sites of the Island of Meroe. In pursuit of achieving these management objectives, CSRM was commissioned to produce a Sustainable Tourism Plan. The main scope of this plan was to guide the development of a tourism program for the Island of Meroe World Heritage Site that would preserve the cultural and natural resources of the region, be a catalyst for social and economic benefits to its inhabitants, and provide visitors with an enjoyable and educational experience. The UNESCO World Heritage Site of the Archaeological Sites of the Island of Meroe is composed of three different archaeological sites located several tens of kilometers away from each other. One of these three sites has been further divided here into two management zones. The Meroe Town Site, located near the village of Begrawiya, by the Nile. The Meroe Town Site is further subdivided into two management zones: the Meroe Royal Pyramid Management Zone and the Meroe Royal City Management Zone. Naqa, a settlement located 30 km away from the Nile. 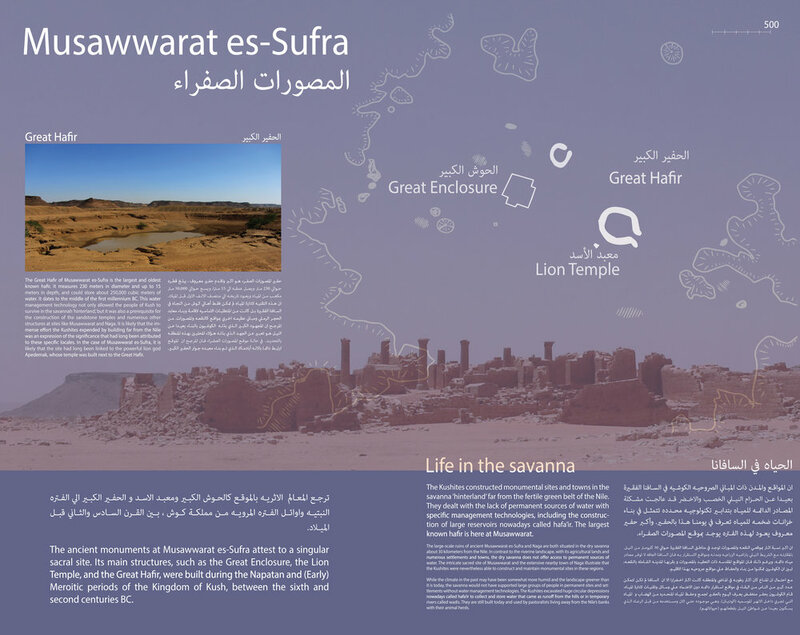 Musawwarat es-Sufra, a ritual site located roughly 25 km away from the Nile. An interpretive program was established for the World Heritage Site. The program encompasses all of the projects and activities that are used to make the public aware of the site. Interpretive themes are the backbone of an interpretive program. With the aid of interpretive themes, the program helps visitors make their way through the site in an informed manner; after they have left, it guides visitors to further information, including to ways in which they can learn more about the site or help support it. Guiding visitor experience through the use of interpretive themes engenders a deep level of engagement that provides an opportunity to convey an understanding of the site that visitors can take with them and use in many ways, from contemplating their place in human history, to making lifestyle choices, to informing their political opinions. One important interpretive theme relates to religion. The Meroites made Apedemak their chief god, thereby solidifying their religious and regional identity. The earliest known temple to Apedemak is at Musawwarat (Photo credit: Dr. Cornelia Kleinitz). An essential objective of an interpretive program is to communicate in a lasting way the concepts, or themes, that are central to that site’s character and importance. Good themes capture a site’s most salient qualities and history, but they are also memorable and relatively easy to grasp, even during a short visit. The themes chosen were most important to an overall understanding of the site’s significance. Some of the more important themes communicated to visitors had to do with the character, political structure, economy, religion, and culture of local political entities, such as the Kingdom of Kush (which spanned the first millennium BCE and the first few centuries CE), and with its relationship with neighboring powers, like Egypt. A demographic evaluation was undertaken to understand the flow of visitors to the four management zones. It was discovered that visitors to the World Heritage Site belong to one of four distinct demographic groups, each of which have different needs, interests, and expectations. These groups are: foreigners who have traveled to Sudan expressly to visit archaeological sites and to learn about Sudanese culture, foreigners who temporarily reside in Sudan (expatriates), Sudanese citizens from Khartoum or other cities or villages in Sudan, and Sudanese students of all ages who come to the site on class outings. Information about people who visited the four management zones was collected in four ways. These were: (1) through infrared sensors at the Meroe City Management Zone and at the Royal Pyramid Management Zone, (2) through a Geographical Positioning System (GPS) study undertaken by Dr. Cornelia Kleinitz at the Musawwarat es-Sufra Management Zone, (3) through survey forms collected from visitors to the Royal Pyramid Management Zone, and (4) through anecdotal information gathered from discussions with stakeholders. Preparing the Sustainable Tourism Plan was a collaborative effort that involved support, guidance, and commentary from the following: Dr. Jane Humphris (University College London Qatar), Dr. Cornelia Kleinitz (Humboldt University), Dr. Karla Kroeper (Staatliche Museen zu Berlin, Ägyptisches Museum und Papyrussammlung), Dr. Hans-Ulrich Onash (Deutsches Archäologische Institut), Mrs. Alexandra Riedel (Deutsches Archäologische Institut), Dr. Silvia Schoske (Museum Ägyptischer Kunst München), Prof. Dietrich Wildung (Museum Ägyptischer Kunst München), Dr. Pawel Wolf (Deutsches Archäologische Institut), Dr. Simone Wolf (Deutsches Archäologische Institut). Doug Comer Announced as Member of the 2018 World Heritage Evaluation Panel. The 2018 inscriptions on the World Heritage List have just been announced by the World Heritage Evaluation Panel. Through the authority of the World Heritage Convention, this panel reviews the nomination dossiers of and recommends World Heritage Sites to the World Heritage Committee. Long-standing policy dictates that the composition of this panel remains anonymous until after new inscriptions are announced. This year, Douglas Comer, Chair and President of US/ICOMOS, was a panel member. The panel consists of approximately thirty (30) invited ICOMOS members from around the world. They represent an extraordinary and diverse mixture of expertise and experience. The 42nd session of the World Heritage Committee has come to a close and the newly inscribed UNESCO World Heritage Sites have been revealed! Of the twenty inscriptions, thirteen are cultural properties, three are natural properties, three are mixed properties, and one property saw significant modifications to its boundaries. Of the thirteen newly inscribed cultural properties, five are located in Europe, three in Southwest Asia, two in Central Asia, two in East Asia, and one in Africa. Of the three newly inscribed natural properties, one is located in Africa, one in East Asia, and one in Europe. Of the three mixed properties, two are located in North America and one in South America. Finally, it was the Bikin River Valley, a natural property located in the Russian Federation, that saw significant modifications to its boundaries. Donate to help preserve World Heritage sites! The human eye registers only a small percentage of the energy that the sun radiates as electromagnetic waves. CSRM uses much of the rest to find archaeological sites.